Examine the Antibiotic plates and look for evidence of a zone of inhibition (no growth or reduced growth) of any of the "control" organisms in an area near the putative antibiotic producer's colonial growth. Evidence of antibiotic production should appear as a measurable zone of inhibition (section of a circle of no growth or reduced growth compared to the growth seen on the control plate). The size of the zone of inhibition is indicative of the diffusion potential of the antibiotic and/or an indication of how sensitive the test organism is to the secreted inhibitor. Compare your results to other tested isolates in your lab section. Think about why an antibiotic might work differently on a Gram positive vs. a Gram negative organism or between two bacteria that are both Gram positive or Gram negative. If you haven't been provided with a digital image, please take a photo of each of your interaction plates. Make sure that the photos are sharp enough to evaluate later. Download them to your dropbox in Sakai. Email them to yourself and to each of your partners. A sample completed assay is shown below. Observe the colonies on your plate, comparing any differences in the appearance of the colony growth of each isolate, alone vs mixed. Look first at each control culture: the inoculum in each of the diagonal spots is a pure culture control as are the spots in the column on the far left. Compare each "spot" where two isolates are mixed to the control spots where each isolate is growing alone. Is either isolate growing better in combination than alone? If so, you have found a mutualistic (beneficial) interaction. For example, in the assay shown above, isolate #102 appears to have a positive effect on the growth of #101, classified as mutualism. Are there combinations that show a reduction in the amount of growth of either isolate compared to the growth of the control areas? If so, you have found an antagonistic (negative) interaction. An example in the assay plate shown above is between isolates #105 and #102. Number 105 seems to inhibit growth of #102, an example of an antagonistic interaction. Note that there are sometimes "edge" effects, differences in the appearance of the colony growth in the cultures along the perimeter of the plate as opposed to those growing in a more protected locations (such as the diagonal control colonies). Spend some time with these plates, carefully and fully evaluating all possible combinations of your soil community isolates for as many as possible examples of mutualism or antagonism. Record your results in your lab notebook with copies of the photos of your plates. Take photos of any plates that show evidence of the presence of antibiotic producers in your soil community. If you found that your isolates did not appear to cause measurable inhibition of growth, does that mean that your isolate does not secrete any antimicrobial compounds? Explain? Today you will make smear slides (Protocols as Smear Slide Preparation Smear Slide Preparation) to perform a few special stains to look for spores, capsules, or flagella ( Stains: Gram Stain) and to repeat Gram stains (but only if you got ambiguous results on your Gram stains). You will inoculate each of your isolates onto all media, placing 4 isolates in a different quadrant of each plate. 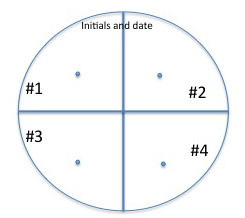 Use a marker to divide the bottom of each plate for each medium into 4 sections and organize a labeling system in your lab notebook and on the plate so you can easily identify where you placed each of your soil isolates: You will spot inoculate the middle of each quadrant by taking a tiny amount of growth on your inoculating needle and inoculating a single spot in the center of a section. Incubate your plates at room temp for several days until you are sure that any inhibition of growth is from selection and not from slow growing bacteria. Put the plates in the refrigerator before they get overgrown. You can analyze them in the next lab. See the illustration below of how to inoculate a plate with 4 different cultures. Fig: 8-1. Testing of multiple isolates in one plate can be accomplished by dividing a plate into 4 sections. Be sure the inoculum is placed in the center of each section and that you check the plate for growth regularly. Directions for the Schaeffer-Fulton Endospore stain and Capsule negative stain are found in the Protocols section of the wiki. Stains : Simple, Gram, Endospore, Capsule. The confirmatory tests for motility are found in Protocols under MOTILITY. All Gram positive bacilli or any bacteria that showed a spore shaped, unstained area in the cells when Gram stained should be stained for endospores. In addition, any Gram positive isolates growing from your dried soil extract on Glyerol Yeast Extract Agar (GYEA) medium should be stained for endospores. There is no need to stain Gram negative isolates for endospores. Would it surprise you to know that most of the spore forming bacteria are common soil organisms? Why would the capacity to form a highly protective, heat tolerant, dessication resistant, non-metabolic spore be useful to soil community microorganisms? Would this capacity give those members a competitive advantage to survive weather extremes? Would you expect a tropical greenhouse habitat to contain relatively fewer or more spore forming members than other habitats? Directions for the Hanging Drop motility test and Flagella stain can be found in the Motility section of Protocols. All bacteria that were positive or ambiguous for motility in NMN medium should be looked at by Hanging Drop technique. Any "swarmers" (bacteria that spread all over the plate when cultured on solid medium)should be looked at by Hanging Drop, too. If the hanging drop test is positive and you have time after you have performed any other confirmation tests or special stains, you could try the Flagella stain, but don't worry if you don't have time for this stain. It is VERY difficult to see flagella even when they are coated with several layers of stain reagent that make the diameter larger. It is hard to get this stain to work well. In 2013 we will not perform this stain. Highly mucoid (sticky and wet) colonies could be tested for the presence of a capsule using the capsule stain protocol if you have time. A capsule is a secreted, protective, adhesive, polysacchride envelope layer outside the other parts of the cell envelope. Some, but not all bacteria produce a capsule. It tends to be a virulence factor in bacteria that are human pathogens because it makes it more difficult for the immune system to recognize the bacterium with a capsule as a foreign invader. If you don't have time to perform this stain to check for the presence of a capsule, don't worry. This stain, like the flagella stain, is also difficult to get to work well. If you want to try it, the protocol is found in the Special Stains section of PROTOCOLS. If your Gram stain results were ambiguous or not what you expected from the growth patterns you observed on PEA and EMB media, you should probably repeat those Gram stains. 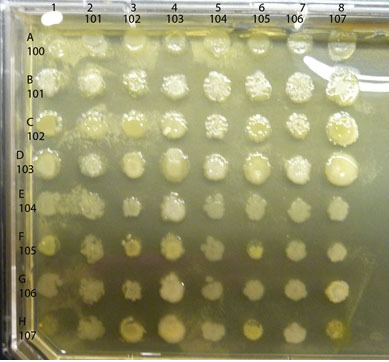 If there are any PEA and EMB plates, consider rechecking the growth of your cultures on these media. Perhaps your earlier cultures were not pure? How did your stains look? Is it possible there were more than one organism in what you thought were pure cultures? If so, what effect might this have on your genomic data? What other implications might there be? The source of the bacterial strain (which greenhouse environment). Information about where in your notebook you first discuss this strain. The date the stock culture used for freezing was made. Graded Assignment: Table of Isolate tests: Design and Analysis and Figures of antibiotic and interactions assay. In lab 9 you will need freshly grown (log phase) cultures of your isolates for species level identification using Matrix-assisted laser desorption/ionization time of flight mass spectrometry (MALDI-TOF MS). Your instructor will provide more information about this technique, but it is very important that your isolates are in log phase growth prior to using the MALDI-TOF. If you have any remaining isolates to freeze for potential future investigations you will be able to use this same young culture. If you have one or two very slow growing cultures, you need to allow enough time to have a small visible colony on your plate. This page was last edited on 4 April 2013, at 07:37.